Nathan James 45001 is a modern, functional, fashionable and stylish utility bar cart with a matte metal frame and tempered glass top. It has been quite popular on Amazon.com, and is rated 5/5 stars by eight customers that have purchased it. Other reviews are for the coffee table, bookcase and side table. You may use it as a bar cart, side table, coffee table and bookcase, which means it is quite a versatile unit. You can get it in black, maple, rustic oak, nutmeg, white/dark oak, black/natural oak, warm walnut or black/dark walnut colors. As a two-tier utility cart it offers ample space while taking up not much space in your living room or bar area. It is suitable for use in living rooms, dining rooms and kitchens. You can put your glasses, wine and beer bottles on it easily and can fit 10 large bottles easily on the lower tier. It has the very thick and sturdy real deal wheels with industrial metal wheel casters that roll smoothly by holding its robust metal handle. You can move it easily from room to room in your house. The two wheels have the solid metal locks on them to keep the unit in place when you find the right spot. You can put your books or magazines on it, use it for serving tea or coffee, meals or use it in your bathroom as the extra shelf space. 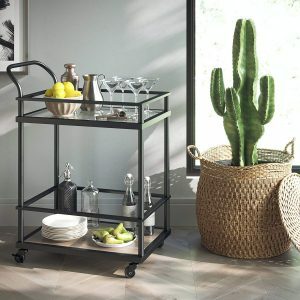 You won’t need any furniture assembly or building experience to assemble this modern bar cart. The clear quick instructions and the tools are included in the box. You won’t actually need any serious tools for putting the pieces together as you’ll twist some of them with your hands. The total weight capacity for both the MDF wooden and the glass shelf is up to 55 pounds each. It is built as a very sturdy and durable product and comes with a long five-year warranty by the manufacturer as well as a 90-day trial period with hundred percent money-back guarantee. Nathan James creates good quality furniture with great design at affordable prices. In the box you’ll find four caster wheels (two of which with locks), an oak engineered MDF wood shelf, a tempered glass, a powder coated steel frame and handle as well as an Allen key and other hardware you may need. Nathan James 45001 weighs 33.8 pounds with a weight capacity of 55 pounds per shelf and measures 36.02 x 24.02 x 16.54 inches. Please note that you can’t switch the glass and MDF wood shelves at the top and bottom. It has a nice simple design and a sturdy construction and you shouldn’t have a problem with the small kids around. A couple of customers had bad luck with the other Nathan James products on the Amazon page but the customer support team got the units replaced straight away. 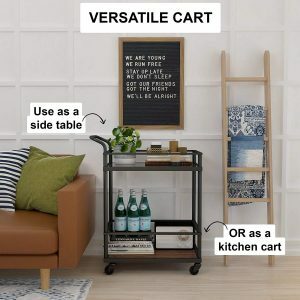 This is a great, simple, durable and versatile utility bar cart at a great price. It offers very good value for the dollar.